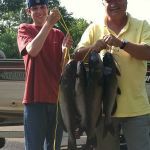 My name is Chris Powell and I am a multi species fishing guide in Wisconsin's Chippewa Valley. Though I have been an avid angler for my entire life, I began guiding in 2007, and it has been a truly rewarding experience for myself. I have met fishermen and women from all over the United States and from all walks of life. 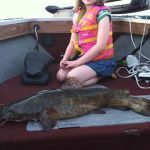 Whether you are unfamiliar with a certain body of water, looking to gain knowledge on fishing tactics, or you are in the Eau Claire/Chippewa Falls area and just want to fish. 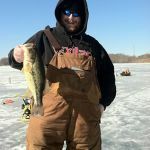 I offer guiding fishing year round! Winter- I offer guided fishing for multiple species. We jig for bluegills and walleyes. 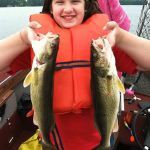 Tip-up fishing for northern pike and largemouth bass, and tip down fishing for crappies and even brook trout! You and a friend will stay warm in my two man Eskimo shelter. Heater provided. Vexilar provided upon request for up to two people. Holes drilled and tackle provided. All you have to do is fish! April-May Ice out is a fantastic time to fish for bluegills! Crappies can be had as well, and Lake Wissota holds some true giants at that! Who says you can't have fun fishing before the first weekend in May? May-June This is a great time of year to fish for multiple species. 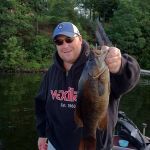 Smallmouth are getting ready to spawn, and this is a great time to catch them! Walleyes are still readily available too. 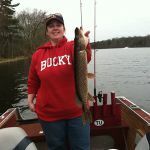 This is also a great time to target northern pike with spinnerbaits. July-August Do you like to catch catfish? Well this is prime time! As a matter of fact, I you are fishing for different species, odds are you will catch at least one! This is a great time to target these hard fighting, underappreciated beasts! The walleye bite will pick up in late July and early August. September-October The walleye fishing is at it's best, as the recreational traffic has settled down. By far my favorite time of year to fish. Walleyes are readily taking minnow tipped jigs and crankbaits as well. You never know, at this time of year you may even catch the incidental muskie! November I do specialty trips in November for trophy sized brown trout on the Lake Michigan tributaries. Trips leave from the Eau Claire/Chippewa Falls area, and are an all day adventure. Please inquire for pricing. Full day of fishing for whatever you want! For learners and pleasure seekers alike. This is 8 hours of fishing, including a shore lunch. Fish cleaning, freezing and delivery provided while you are in the area. By land or boat. Ideal for anglers that just want to get out for a bit, learn a couple of spots, or just relax. Fish Cleaning available. I am offering 2 full days guided on Lake Wissota for $500. This is a great opportunity to learn the lake, and truly see what it has to offer. We will target walleyes, bass, catfish, northern pike, bluegills, or whatever you want to do! Shore lunch provided on first day, fish cleaning, freezing and delivery available while you are in the area. For up to 2 people (additional anglers $25) Whether you want to learn to ice fish, learn where to fish on the lake, or just want to relax. Jig for bluegills, crappies, perch, trout, and walleye. Tip up fishing for northern pike and walleye. Portable shack, heater Vexilars, waxies, and hole drilling provided. Minnows extra. Dress Warm! Fall Salmon/Trophy Brown Trout - Please Inquire for pricing. Available all day Friday-Sunday - Available Evenings Monday-Thursday begining in May.